There are many types of bracelets you can find on the market. From subtle bangles to statement cuff bracelets, a woman can never have too many of these beautiful jewelry pieces. To read about bracelets for women various styles, access this article. But, as you well know, an important part of maintaining your jewelry is to clean it regularly. However, you cannot clean a thin bangle the same way you would a beaded bracelet. So here is everything you need to know about cleaning different types of bracelets. How many types of bracelets are there? Bangle bracelets or bangles are circular and inflexible. They are usually made of gold or other precious metal and, sometimes, they feature gemstones. In this category, you can also find the open bangle which has a gap on the inside of the wrist part. Usually, beaded bracelets are flexible and can be stretched. They feature an array of beads made of gemstones, glass, wood or even plastic. Beaded bracelets are versatile and they come in many styles. One thing that applies to all of them is that you cannot see the chain holding the beads together. The gemstones get all the fun. Link bracelets or chain bracelets are a classic. They feature a chain (which can have various styles) and a clasp closure. Chain bracelets are usually made of precious metals, but you can also find beautiful stainless steel chain bracelets. These cute bracelets usually feature a chain with charms hanging from it. The charms can be anything from zodiacal signs to objects and letters. Charm bracelets are very popular right now and they are also easy to match. You can get a charm bracelet from the jewelry store or you can make one yourself by getting a chain bracelet and different charms. 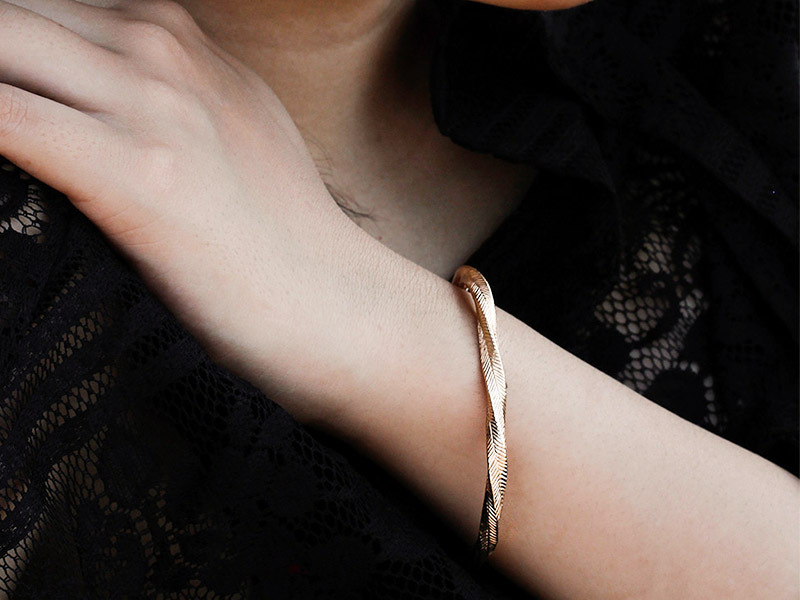 Cuff bracelets resemble the open bangles, but they usually are chunkier and wider. As opposed to bangles, cuffs can also be adjustable. Of course, before trying to adjust your cuff bracelet you should check out its instructions and see if it is adjustable. As the name suggests it, slider bracelets are adjustable and can fit any wrist size. They have an adjustable closure that allows you to change the size of the chain. The extra chain piece will hang beautifully along your hand. This type of bracelet may be named after a sport, but it has nothing to do with sports. It features a straight inline chain with gemstones placed each in their own setting. The gemstones are usually diamonds. This elegant bracelet got its name after a tennis match, but we don’t recommend you to wear it while doing sports. As you can see, there are many types of bracelets and you have to be careful not to apply the same cleaning method to all of them. Of course, the metals or materials are also important when cleaning your bracelets. To discover how to clean a stainless steel bracelet, read this care guide. Bangles and simple cuff bracelets (which don’t feature any gemstone) can be easily cleaned using a damp microfiber cloth. Because you don’t have a setting, it is easier to remove all the dirt on oils from these types of bracelets. A damp cloth is safe for any metal, but if you want to use warm soapy water, we recommend you not to try it on plated jewelry. Tennis bracelets and gemstone cuffs will be harder to clean because you also have to clean the settings and the gemstones. Use a damp lint-free cloth to carefully remove dirt. Then, before drying your bracelet, use a damp jewelry brush (or a soft toothbrush) to reach the hard parts. Clean the setting along the gemstone, then use the cloth to remove the dirt. Make sure you dry the bracelet afterward. Beaded bracelets can be very fragile, so take extra care when cleaning them. Don’t rub too hard or you may break the flexible strand or chain. Instead of using a cloth to clean all the gemstones at once, use a jewelry brush or a toothbrush to clean each stone individually. Dry your bracelet using a lint-free cloth. With charm and chain bracelets, the dirt can get inside the links, so using a cloth may not be very efficient. Instead, use a soft toothbrush to gently clean the links. When it comes to charm bracelets, you also have to clean the charms, but be very careful not to break them. Slider bracelets may be the most difficult to clean because of the adjustable closure. You can clean the chain and the gemstones the same way as you would a beaded bracelet. The closure, however, needs extra cleaning because dirt can easily get inside it. Use a thin toothpick to gently clean the inside of the closure and be careful not to scratch it. To view amazing bracelet collections, click here to go to Ana Luisa online shop. We feature designer jewelry collections at fair prices and each item in our collections is limited edition.